Charles “Chuck” Foster of Hannawa Falls and Duane Pelkey of Madrid were recognized on June 13 as a Paul Harris Fellow by the Rotary Club of Potsdam. They were honored for their demonstrated commitment to the goals and purposes of Rotary and "in appreciation of their tangible assistance given for the furtherance of better understanding and friendly relations among peoples of the world." One-thousand dollars has also been donated in each of their names to the Rotary Foundation, a not-for-profit corporation that supports the efforts of Rotary International to achieve world understanding and peace through international humanitarian, educational, and cultural exchange programs. The contribution honoring Foster and Pelkey will be used for projects like saving the lives of children through immunization, bringing water to remote global villages, or the establishment of hospitals in under-developed countries. Foster, a native of Russell, has been a member of the Potsdam Rotary for 17 years, serving as president, program director, co-chair of the Holiday Fund/Fright Night books and co-chair of the Wheelchair Challenge. He has been an active Rotarian, working at nearly every Duck Pluck, Golf Tournament and holiday event. He and his wife, Mary Sue, are known for their theme parties for Rotary fellowship gatherings. Foster is a retired SUNY Potsdam biology professor, a position he held for 38 years. He was chairman of the department, the NCAA representative, and for many years known as the “Voice of the Bears” for Men’s Basketball. Foster graduated salutatorian of Knox Memorial (with 12 years perfect attendance). He completed his bachelor’s degree at Potsdam and earned his master’s at Michigan State. He is also a life member of the Potsdam Elks and the first person in the Potsdam community to have served both as exalted ruler of the Elks and president of Rotary. Foster has been retired 16 years and enjoys traveling, classic movies, cooking and games of chance. His greatest joy has been making memories with family, including his wife of 32 years, his children and grandchildren, and his 96-year-old mother. Pelkey graduated from Massena Central in 1983 and SUNY Potsdam in 1989 with a degree in writing, minoring in psychology. He started his career with Key Bank in Watertown and got his first branch management assignment in the Binghamton area, and first joined Rotary in 1991. Pelkey managed a number of progressively larger branches for financial institutions throughout the Southern Tier. He was working for Fleet Bank in 2001, when Community Bank made one of its many acquisitions and he joined them as a commercial lender. Back in the North Country since 2006, he has sat on numerous boards and volunteered for many worthwhile organizations. He and his wife, Laurean, co-own a year-round ice cream and frozen yogurt shop in Potsdam. Currently, Pelkey serves as a committee member of the St. Lawrence Leadership Institute, a director and incoming vice president of the Potsdam Rotary, a board member of the SUNY Potsdam Business Administration Advisory Council, a board member of the North Country Alliance, and a board member of the North Country Children’s Museum, where he will be installed as treasurer in the fall. Photo caption: Charles Foster and Duane Pelkey were recently recognized as Paul Harris Fellows by the Rotary Club of Potsdam. 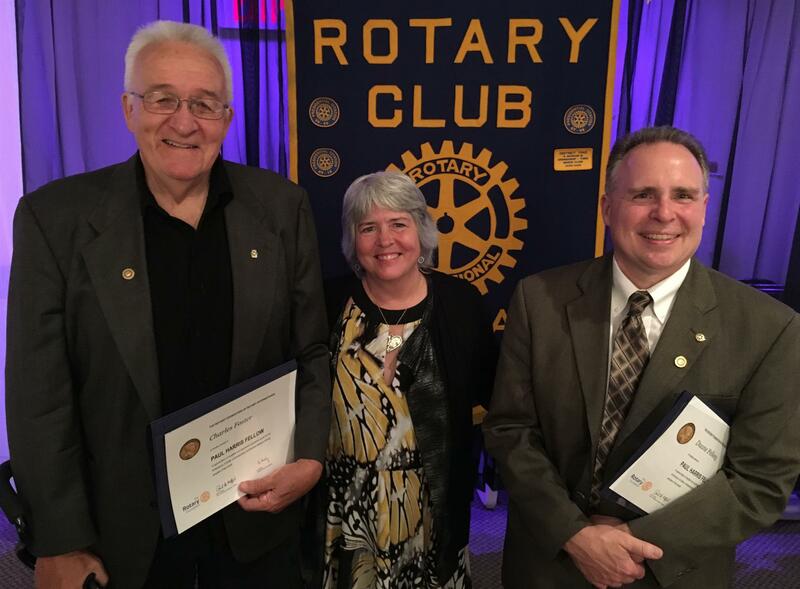 Above, Foster (left) and Pelkey (right) receive certificates from Potsdam Rotary Paul Harris Committee Chair and President Mary Sue Foster.